New Republic: The FCC's Revolving Door Is Shameless FCC commissioner Meredith Atwell Baker is leaving her position to become the chief lobbyist for Comcast/NBCUniversal - a merger she voted for only months ago. James Downie of The New Republic writes about this trend and whether or not the FCC is still affective. 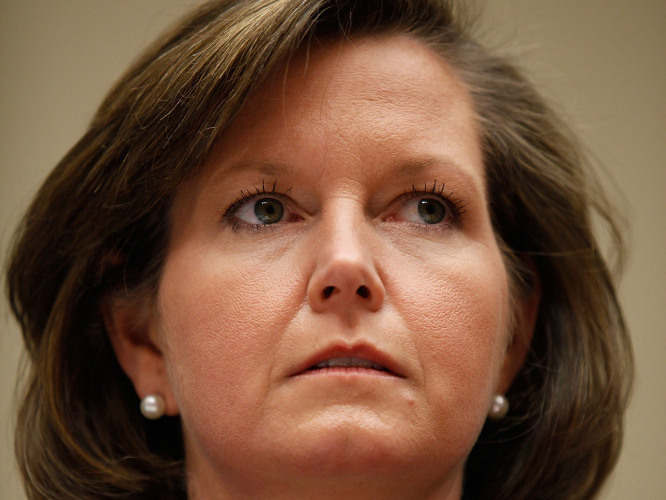 FCC Commissioner Meredith Attwell Baker testifies at a hearing in March in Washington. Baker announced last week that she would leave her FCC position to become the chief lobbyist for Comcast/NBCUniversal, a merger she voted for. Baker's announcement, however, was greeted with nary a shrug from the FCC and the congressmen tasked with its oversight. Her departure merited only a cursory statement from commission chair Julius Genachowski. Worse, when the FCC commissioners appeared before the House Communications and Technology subcommittee last Friday to discuss "FCC Process Reform," subcommittee chair Greg Walden merely noted Baker's absence and not a single representative asked a question related to the propriety of her recent move. One might be forgiven for asking: Why? The simple answer is that, sadly, what Baker did is not all that unusual. Baker is far from the first commissioner or staffer to leave the FCC and move right to the industry he or she just finished regulating. In 2002, Dorothy Attwood, former head of the FCC's Wireline Competition Bureau, resurfaced (less than two months after leaving the FCC) as the "senior vice president for federal regulatory strategy" at SBC Communications. In 2008, Catherine Bohigian, a close adviser to former FCC chief Kevin Martin, stepped down to go work for Cablevision. And that's just the tip of the iceberg—the practice goes back decades. "Working at the FCC has become a stepping stone to cashing in with these major companies," says Craig Aaron of Free Press, a media transparency nonprofit. "No wonder they're pushed aside by AT&T et al." Sometimes, when companies vie against each other in front of the commission—like Google, Sony, and the Consumer Electronics Association (CEA) are doing now in a fight against the cable companies—they all compete to see who can hire the most influential former FCC employee. As a result, cable's main lobbying group just appointed former FCC chair Michael Powell as its president and CEO, while Google's senior policy counsel, Johanna Shelton, once worked as an FCC attorney, and the CEA has retained several high profile lobbyists who used to work for the FCC. "One company hires a staffer, and their rival hires two, and so forth," says Art Brodsky, communications director at Public Knowledge, a consumer advocacy group. "It's the old concept of mutually assured destruction." To be sure, a commissioner or staffer leaving the FCC for industry doesn't always produce a bad outcome for consumers: In 1971, Brodsky notes, MCI hired former FCC commissioner Kenneth Cox, who had voted for the fledgling communications company while he was on the commission, to lobby the body on which he once served. Thanks in part to Cox's knowledge of the federal bureaucracy, MCI was able to provide critical evidence in the Justice Department's successful anti-trust lawsuit against AT&T, which broke up the Bell monopoly. But none of this changes how despicably lax the regulation of the FCC's revolving door has become. Under current rules, Baker can't lobby the FCC directly for two years, but nothing prevents her (and other former FCC commissioners) from lobbying congressmen and staffers on the relevant committees. And instead of being required to work somewhere other than the corporations the commissioners just regulated for a mandatory "cooling off" period, former FCC commissioners are currently free to cash in on their experience immediately. If nothing else, more transparency is needed. The FCC no longer requires that commissioners and staffers seeking employment with industry submit a recusal letter, a requirement that could very easily be reinstated. "At the very least, we could put some shame into the idea of the revolving door," says Aaron. Until then, expect this cynical game to continue apace.